Bunsen was born on March 31, 1811, in Gottingen, Germany. He received a doctorate in chemistry from the University of Gottingen in 1830 and subsequently taught at three other German universities. In 1852 he was appointed professor of experimental chemistry at the University of Heidelberg, where he was extremely popular with students and built a highly regarded department of chemistry. Bunsen worked in several diverse fields of chemistry. He discovered an antidote to arsenic poisoning in 1834: freshly precipitated hydrated ferric oxide. In 1837 he began to work with cacodyl compounds, dangerous arsenic ­containing substances. He lost the use of one eye in a laboratory explosion, nearly died of arsenic poisoning, and eventually banned the study of organic chemistry from his laboratory. 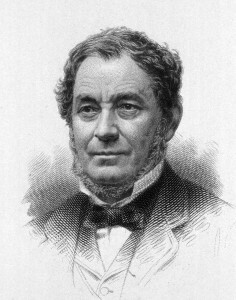 Bunsen constructed a carbon­zinc electric cell and used it to produce a bright electric arc light in 1841. To measure the lights brightness, he invented a grease­spot photometer in 1844. Using the carbon­zinc cell, he became the first to isolate metallic magnesium and to show that it emits high­ intensity light when burned in air. He also prepared the first pure sample of the metal lithium. In the 1850s, Bunsen studied the heat lost with the waste gases of blast furnaces and presented his results in 1857 in Gasometric Methods, his only major publication. Bunsen began a partnership with Gustav Kirchhoff, which led to their invention of the spectroscope in 1859. The two chemists observed that each element gives off light of a distinct wavelength, represented by a dark band within a spectrum’ of light. In 1860 they discovered two new elements, cesium and rubidium, when they recognized two unknown bands in the light spectra of certain mineral compounds. In his later years, Bunsen designed and built a filter pump, an ice calorimeter, and a vapor calorimeter. Although the Bunsen burner bears his name, Bunsen did not invent it. It was constructed by his technician, Peter Desdega, based on a design by MICHAEL FARADAY. Bunsen died in Heidelberg, Germany, on August 16, 1899. Bunsen’s experimental endeavors left a significant mark on the development of various fields of chemistry. Working with Kirchhoff, Bunsen recognized that every element when heated gives off a spectrum of electromagnetic radiation that is the “fingerprint” unique to that element. Bunsen and Kirchhoff’s technique of spectral analysis enabled other scientists to discover several unknown elements after 1860. Heavy elements proved to have very complicated spectra, and scientists could not fully explain all the spectral components that appeared. This called for attempts to determine the origin and structure of spectra, the results of which led to revisions in the fundamental tenets of chemistry and physics. Bunsen and Kirchhoff’s spectral­analysis research was soon used to determine the chemical components of heavenly bodies, and the field of astrophysics was born. Spectral analysis proved especially valuable in characterizing solar flares. Applying spectral analysis to other stars, scientists found that stars did not all have the same spectra, as had been thought previously. Identification of the various stellar spectra led to the modern system of spectrum­ based stellar classification. Bunsen’s work in organic chemistry stimulated one of his students, Edward Frankland, who became a successful experimental chemist. Frankland prepared and analyzed the first known organometallics, the zinc dialkyls. Organometallics encompass a wide range of substances, including many catalysts, all of which include at least one carbon­metal band. This work led him to the theory of valence, which states that there is a limit to the number of bonds two atoms or groups of atoms can create while forming a compound. Valence theory set the foundations for the emerging field of structural chemistry.